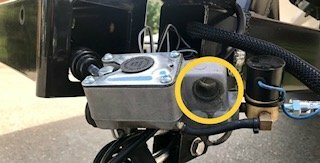 Yup, I forgot to disconnect the boat trailer emergency brake cable! The hitch is actually a pretty simple system. Trailer braking is controlled by the actuator mounted on the tongue of the trailer. 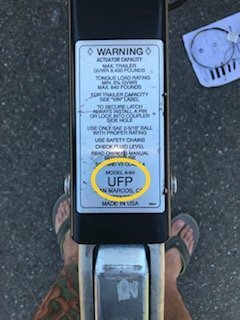 When the tow vehicle brakes are applied, the “surge” or “push” of the trailer toward the tow vehicle automatically applies and synchronizes the trailer brakes with the tow vehicle brakes. 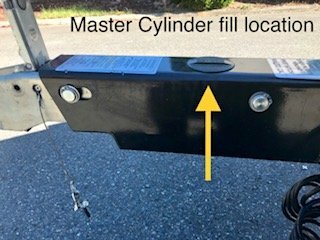 The coupler slides into the actuator applying force to a piston inside of a master cylinder, which applies the trailer brake.At constant speed, the brake actuator master cylinder piston is in the free (extended) position; and the trailer brakes are not applied. The shock absorber controls random application of the trailer brakes when towing on rough roads. When the tow vehicle slows down, the trailer moves toward the tow vehicle. The actuator slides over the coupler, applying force to the master cylinder piston in direct proportion to how fast the tow vehicle is slowing and how much the trailer weighs. The piston moves into the master cylinder, building pressure to apply the trailer brakes. The shock absorber makes sure the brakes are applied and released smoothly. 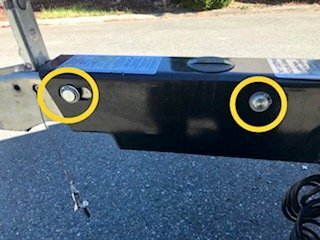 All actuators must have a way to apply the trailer brakes should the trailer become completely detached from the towing vehicle. The breakaway cable is the third line of defense after trailer separation. Before the breakaway cable is pulled, the coupler must become detached from the hitch ball and then the safety chains must fail. At this time the breakaway cable is pulled which will apply a braking force to the trailer. Note: The breakaway system is not intended to lock up the trailer brakes after tow vehicle separation but rather to apply just enough braking force to keep the trailer from free-wheeling down the road. The breakaway system must be reset manually after it has been activated. So with all that being said its time to get dirty! 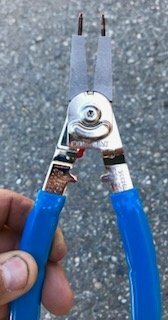 Before you begin you will need a pair of snap ring (circlips) pliers, without them you will not be able to even start this job. First order of business is to remove the two snap rings (circlips) from both pins. Once the snap rings are removed you need to pull both roll pins out. 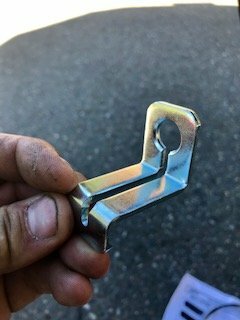 Once the pins are pulled you can pull on the hitch receiver mount to separate the inner member from the neck, exposing the internal workings such as the shock absorber, master cylinder and such. 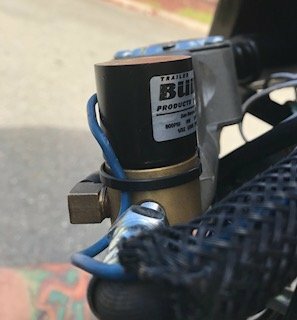 Now this little guy is the best thing invented since sliced bread, this is the electronic reversing solenoid, Its sole purpose is to allow you to back up without the brakes locking up. If you've ever tried to back your trailer up without having the plug in your rig then you know what I'm talking about. If you don't have one of these little buggers then you will have to use a lock out key or plug. 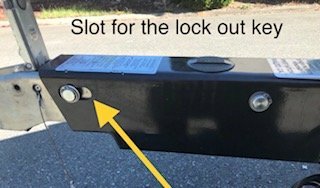 The purpose of a lock out key is to fit behind the front sliding roll pin to "lock it out" from sliding back and engaging your brakes while reversing. it is also suggested to use even with the reversing solenoid when backing over soft ground or up an incline without the brakes fully engaging. The plug is just that, a plug that goes in your master cylinder reservoir and accomplishes the same results. Once you separate the inner member from the neck you can separate the pushrod assembly from both the master cylinder and the safety release bracket and pull the cable attachment bracket off and replace it with the new one. Yours may or may not be broken or distorted, mine was not but I elected to replace it anyway. After you replace the cable attachment bracket and connect the cable you can start to assemble everything. 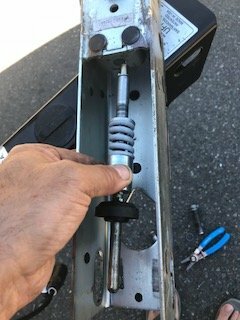 When inserting the push rod into the push bracket you have to depress press the safety release bracket to allow the push rod to slide in. 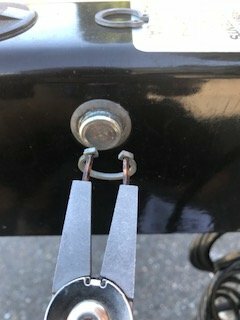 The correct orientation of the clip is to face it so the cable pulls towards the boat first then loops back around to either stick out the front or side of the trailer hitch. About the only problem I ran into was once I separated the inner member from the neck these plastic spacers became dislodged and was a mother to get back in position when reassembling. They fit in a recessed area on the master cylinder at the rear pin area and are next to impossible to place while sliding the inner member past them. The correct orientation is smaller flange towards the master cylinder. Honestly its not that big or hard of a job. Maybe a touch intimidating because nobody wants to tear into their braking system of their trailer and mess it up, but it seriously took me all of 20 minutes to complete, and 15 of that was trying to line up those plastic spacers! Sometimes you have to do what you have to do. Just for my own curiosity, what did they charge you for the job? 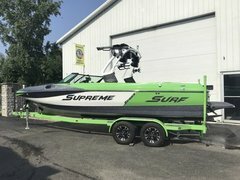 Great write up, I have a couple I need to do, have pictures but, have not had time. 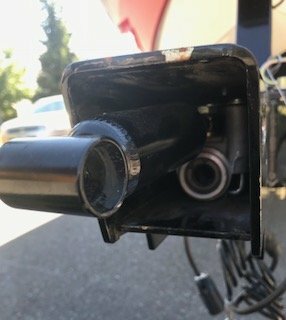 Im sorry about the delayed response, I personally would start with all the simple solutions first such as the pushrod release bracket, its located on the under side of the hitch right behind the hitch ball socket. 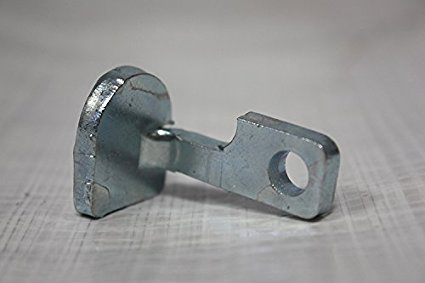 If you've already tried that or If pushing up on the bracket dose not release the brakes or if it is hard to push, insert a pry bar into the 5/16” hole behind the bracket. Use the pry bar to stroke the push rod backwards to relieve the load on bracket. Push up on bracket and hold up while releasing the pry bar. The pushrod release bracket should now move freely and your brakes should be released Double check to see if the actuator is reset by pulling the actuator out fully, remove the cap from the top of the fill reservoir and while looking at the fluid in the reservoir, manually compress the actuator. The fluid in the reservoir should ripple slightly. If it does, the actuator is working properly. If you've tried both of these things first then yeah it more then likely is your solenoid. 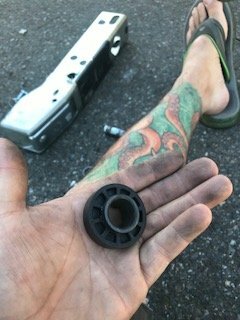 I take it the trailer is not under warranty? ...Before the breakaway cable is pulled, the coupler must become detached from the hitch ball and then the safety chains must fail. At this time the breakaway cable is pulled which will apply a braking force to the trailer. Note: The breakaway system is not intended to lock up the trailer brakes after tow vehicle separation but rather to apply just enough braking force to keep the trailer from free-wheeling down the road. 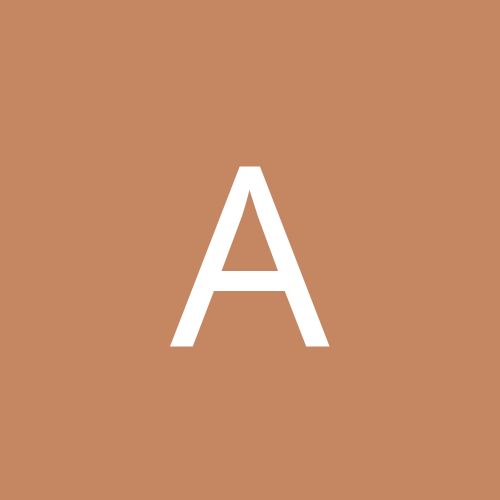 The breakaway system must be reset manually after it has been activated. If my trailer became detached from the ball, I think the breakaway cable will pull before the safety chains fail. 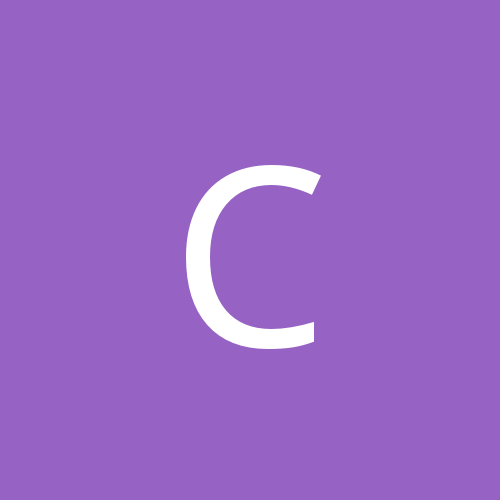 The breakaway cable is short enough that it will engage before the chains are fully extended. Is that wrong? 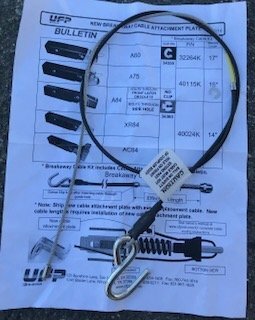 "The best length for the cable of a breakaway system...will be where the pin would get pulled right as the trailer would come uncoupled. 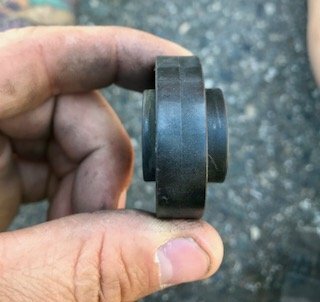 The reason for this is that if the trailer would come uncoupled and the safety chains were to catch the trailer you would still want the brakes to apply."